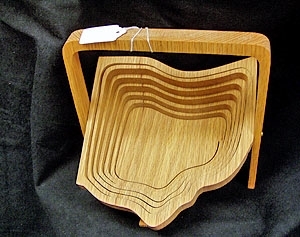 This collapsable basket is made from solid oak by Amish craftsman, John Keim. It's formed with one continuous saw cut and can be stored flat when not in use. The basket can be handily used to hold snacks, knickknacks, and collectibles, or can be featured for decoration on its own. Like wood cutting boards, the basket comes treated with non-toxic oil and can be cleaned with a damp cloth, if necessary. 7 1/2 x 8 x 8h inches when open.